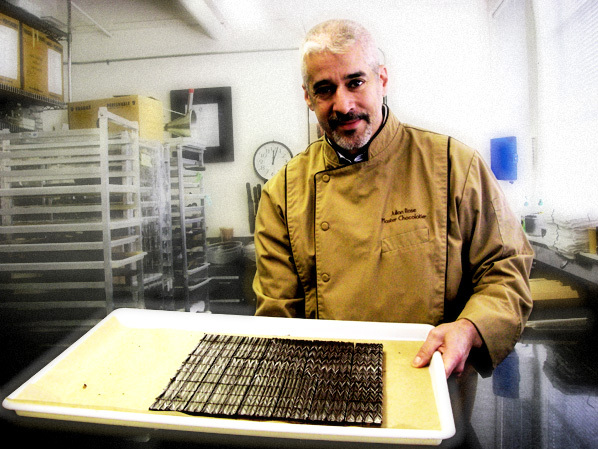 I first became aware of Portland’s Moonstruck Chocolate, and Master Chocolatier Julian Rose, a couple of months ago, when I was doing a post on Fortunato No. 4, a rare, and newly re-discovered chocolate from Peru. I had been given a sample of it, and wanted to find out “who had it” and what they were doing with it. 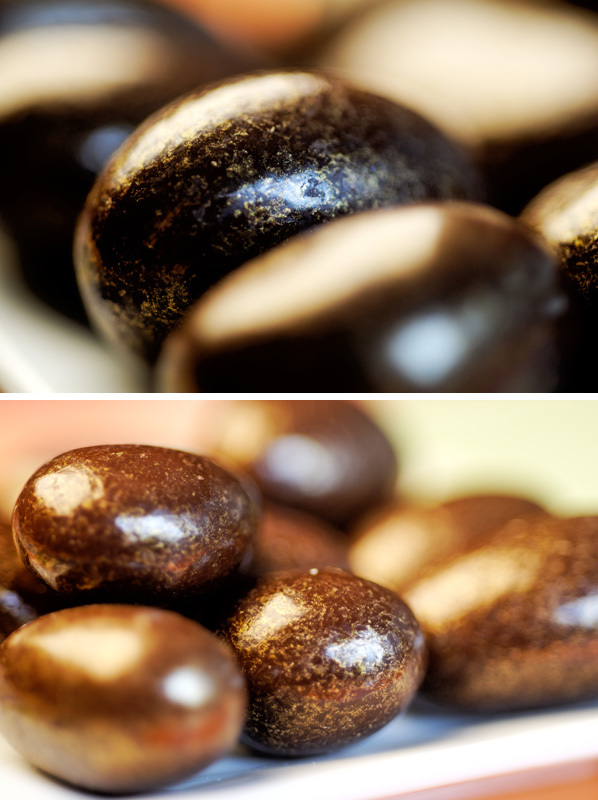 What Julian Rose and Moonstruck are doing with it is, making the most fabulous tumbled dark chocolate beans, essentially the Pure Nacional cacao beans tumbled in a coating of their own chocolate and a shining “secret” golden glaze. And I was long overdue for a visit to Portland to see my beloved sister, brother-in-law, niece and nephew. It was but the work of a moment, when I mentioned to my sons the possibility of a road trip to the land of Voodoo Doughnuts (The magic is in the hole) and The Stepping Stone Cafe (“You eat here because we let you”) to have them completely on board – a good thing too, because we were taking the train. 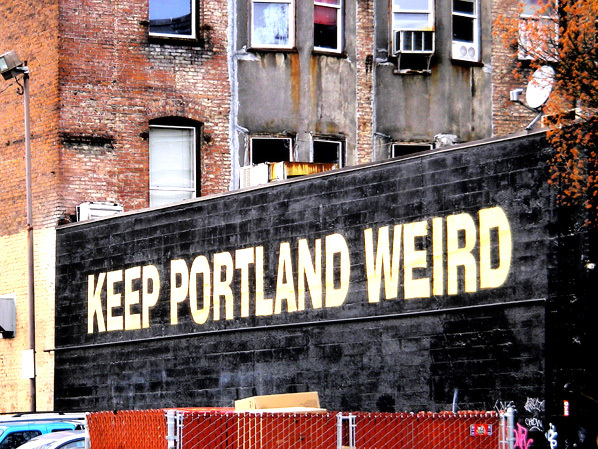 As luck would have it, my dear friend and her daughter were also planning a pilgrimage to Portland’s Powell’s Books, at the exact time we would be there, and we all arranged to meet up and see the sights of the city. It was, to quote Jane Austen “as perfect a plan as plan could be”. 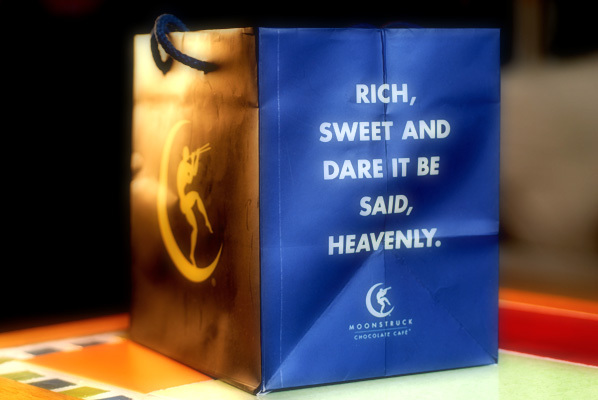 What would make it perfect for me was a pilgrimage to Moonstruck Chocolate. 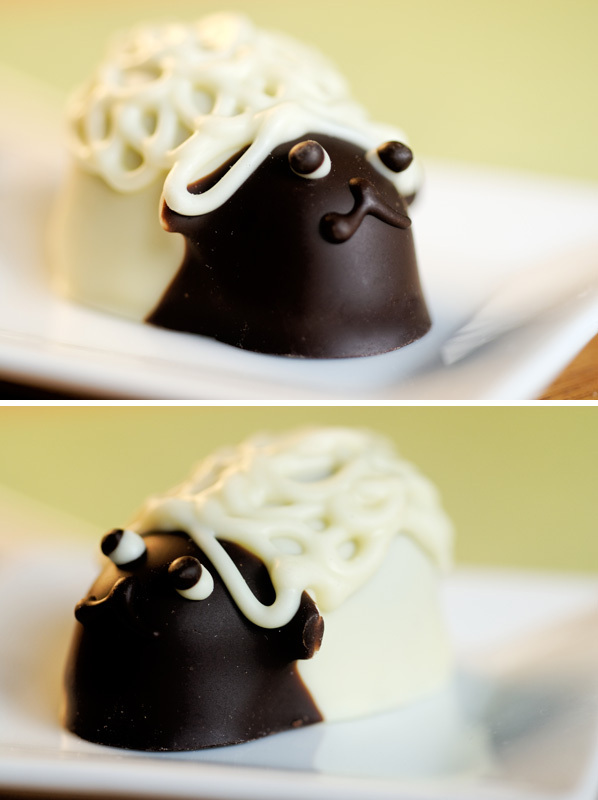 I contacted Chef Rose, and he kindly agreed to grant me some of his valuable time to talk about his passion for all things chocolate, and since he was in the factory on that day, he generously offered to take me around it. I understood this was a special favour – they don’t usually grant tours. They do, however, have a link on their website to a great little behind the scenes look at how their chocolates are made. The first thing that strikes me as I walk in the doors at the Moonstruck factory, is the heady chocolate aroma. If it is true what aroma therapists say, I think this place provides its workers with all kinds of positive therapeutic energy! We (my sister, brother-in-law and I) are greeted by Chef Julian and welcomed by the lovely Allyson Savage, Moonstruck’s director of marketing. We go off to the test kitchen, where inspirations and ideas become recipes. They are tested in small batches by Chef Rose, and his skilled colleagues. He explains the importance of testing the recipes at each stage, gradually increasing the batch size, but always keeping the batches relatively small, and how it is not simply a matter of increasing the amounts of each ingredient – in fact there is a great deal of finessing and adjusting – the chemical balance of a certain combination of simple ingredients such as fine cream and chocolate can be completely thrown off if not carefully monitored and of course, tasted at each stage. 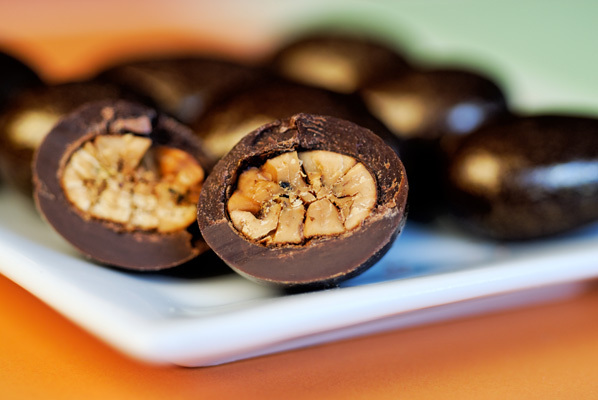 Moonstruck Chocolate’s five busy, vibrant cafes in the Portland area are often used as Beta testers for a recipe Chef Rose may be “auditioning”. He estimates that it takes from 9-12 months to take a recipe through the trials of development, until it is finally ready for production in the factory – and that is, of course, only if it “audience” has deemed it worthy. He mentions, for example, an interesting sounding strawberry/basil truffle, which was tried, but just didn’t prove itself a big seller. Likewise, an idea for a candied Oregon tomato centre seems really interesting, but he knows will have limited appeal. It sounds wonderful to me. Hmmm, just like in the theatre world – an idea may seem like a winner, but if your customers don’t respond to the combination of taste and texture, that truffle is not going to find its way into the distinctive blue and gold box. Today, Chef Rose is working on a peanut butter milles feuilles, which he graciously allows us to sample. I am an absolute sucker for anything peanut butter, having resorted to jabbing a chocolate bar into a jar of peanut butter when absolutely necessary, but this is smooth, sophisticated and not overwhelmingly cloying. While not flaky milles feuilles pastry, it melts on the tongue rather nicely. Through the factory doors, and over to the copper kettle full of molten caramel, just ready to be poured out onto the cooling slab. This is pure caramel, the chemical reaction between the copper and the cream producing the rich flavour. It takes its place next to a batch of salted caramel, and we turn around to find ourselves face to … rump. 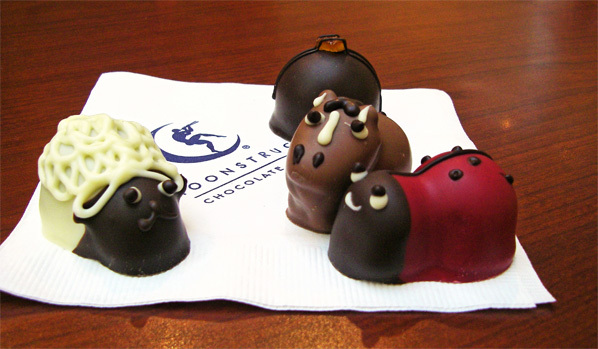 Moonstruck Chocolates is known for its charming and delicious “critters”, and I am looking at a fresh batch of cows, the heads and bodies hand-formed from ganache, and secured together, ears and noses applied, awaiting the next steps, which will give them their distinctive personalities. Each piece is hand dipped, and sent to be decorated, once again, by hand. The sure-handed artisans at the next table are applying spots to each cow, every one slightly different, placing the whites of the eyes, then dotting them. They seem to come alive, just like the ceremony where the eye is dotted on a dragon boat. Precise and deft, this work requires zen-like patience, I am sure. We move to the enrober, where truffles on a belt are receiving a double-stream shower of chocolate, precisely tempered to provide a thin, even coating, before moving down the belt to be cooled in 3 stages, and emerge at the other end, glossy and ready for final hand decoration. I am amazed at the attention to detail in each piece. “Tumbled chocolates are fashioned with a nod toward the ancient Egyptians’ practice of “panning” ingredients: slowly drizzling chocolate over nuts, dried fruit and other complementary centers, all while rolling and tossing the treats to achieve layers of chocolate perfection”. Wow, it is loud in here. The candied Oregon blueberries have received layer upon layer of chocolate, and have rolled upon themselves over and over like so many marbles, and Richard is now ready to apply the final gloss. A whiff of grain alcohol permeates the room for a moment, as the gloss goes on, and the alcohol is immediately evaporated, helping the gloss on the berries to dry. We sample them, then and there. My sister, an avowed blueberry hater concedes to a liking of the way they prepare the “little blue fruit”. My brother-in-law is in ecstasies: “A heady experience … as if I’d just taken a sip of a cool blue martini.” I am less eloquent but no less enthused – I could eat a whole bagful. Our last stop is back in the test kitchen, where we sample Fortunato No. 4 tumbled cacao beans. If I had any doubt whether I liked this chocolate before (and the first time I tried it, I did) they have been swept away. Oh my, these are crunchy delicious, intense, winey and so rich. 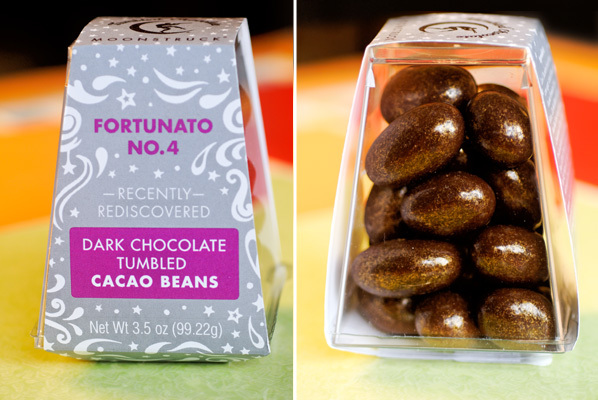 “The Fortunato made me rethink everything I thought I knew about chocolate. It was rich and smooth, with deep fruit undertones and a sweet/smoky flavor I never before associated with chocolate. The flavor stayed with me even to this day, truly a “long finish”. We finish up with samples of two, single origin bars, one a Dominican Dark and the other, a lovely Venezuelan Milk, which tastes rich and not overly sweet, almost lemony. A nice palate cleanser to finish off our tour! It has been a glorious morning. I am very grateful to Chef Julian Rose and his colleagues for allowing us to experience the aromatic, handcrafted, hand-decorated, hand-packaged in Portland world that Is Moonstruck Chocolate. But I cannot leave Portland without taking some of that magic home with me, so we stop at the Rotunda Cafe in Pioneer Place, and help ourselves to some critters, truffles, and tumbled beans to take home. Whether they survive the journey is another story!